Waterfront real estate in Chatham is a dream. With homes of all different sizes and styles, you're sure to find exactly what you're looking for. Scroll down to experience waterfront real estate at its finest. View a list of Chatham MA waterfront real estate below and contact Chatham Real Estate to learn more. If you would like to save your favorite Chatham waterfront homes, please register with our website. You might also like to view Chatham shorefront homes or Chatham luxury homes. Flawless Waterfront estate on sheltered inlet offers panoramic views over THE OYSTER POND to the church steeples in town and is sited on a very private lot with its own saltwater dock . Completely rebuilt(2002-03) from the ground up including top of the line heating and cooling systems, this tremendous home offers an inviting kitchen with walls of windows overlooking the water and includes Viking and Wolf appliances, copper farmer's sink and breakfast room. The Great room beckons with soaring ceilings, stone fireplace, and multiple french doors leading to patio. A screened porch with fireplace, solid cherry paneled study and grand gallery are just some additional spaces. Surrounded by flowering coastal gardens, Pickle ball court and boating access to Nantucket Sound. When privacy matters. ''BEST WATER VIEW IN CHATHAM..''This unique Royal Barry Wills 4BR,3BA home is perched on a revetment protected lot overlooking Nantucket Sound in three directions. Private beach in front of the house and off to the west on a separate parcel included in this sale gives you your own sandy beach for swimming, boating, or just relaxing in the sun..The home has been meticulously maintained over the last 38 years by this same family and has recently redone the kitchen, bathrooms, some windows, roof, and more. Beautiful second floor master bedroom with a south facing deck looking out into the Sound, past Monomoy to the east, and half way to Nantucket. Spectacular water views from almost every room in this very exclusive location close to town and everything the Town of Chatham has to offer... House is a Royal Barry Wills design...All buyers and buyer agents are encouraged to verify all information and measurements as they can be rounded and/or information estimated.....Flood insurance of $1900 per year is transferable.. House flood protection has been extensively upgraded for issuing of Elevation certificate...Sale also includes extra 12,500 sq. ft. Lot #8 adjacent to house to the west.... Several miles of walking beach to the east of the property extending to the lighthouse and Stage Harbor.. Listed by Happy C Van Sickle of William Raveis RE & Home Serv. Waterfront home on Ryder's Cove with deep water access for boating, fishing clamming, beautiful sunsets and the mooring area is right in front. Walk via the private path to the assoc. beach. This luxury home is truly elegant offering the perfect balance between formality and livability. The interior is enhanced with Brazilian cherry floors, custom cabinetry and beautiful mill-work. This amazing home features a first floor master suite and the living room is spacious and beautiful with a coffered ceiling, built-ins, wet bar and multiple sliders to the deck great for entertaining overlooking the water. Sunny finished lower level is just as glamorous with lots of glass to enjoy the views. Family room, exercise room, bath with steam shower and game room.Exterior is enhanced with a custom Japanese water fall, patios, gardens, heated driveway. Buyers agent to verify all information . Please take a moment to view the virtual tour. In the breathtaking and desirable location of Chatham, this Waterfront on Crows Pond has it all. Deep water Access, a Dock, and unobstructed views in abundance. With 6 bedrooms, 3 full bathrooms, and 2 family rooms, there is plenty of space to spread out and enjoy. Enjoy its charm and character as is with gorgeous hardwood floors throughout, or update to your liking, this home has been well loved for generations. $100,000 below assessed value! Set in the most desirable and coveted North Chatham location, this coastal retreat sits on nearly an acre lot with breathtaking views of a salt water pond and Pleasant Bay. This three Bedroom, three bath home lies nestled on a quit street with rolling grass lawns and mature trees, making it the perfect tranquil escape. The first floor has an open floor plan with kitchen and large island adjacent to living room and dinning room. Spacious master suite with soaring ceilings, windows and fireplace. Three sets of french doors lead to an oversized back deck, perfect for entertaining family and friends.Upstairs you will find an en-suite bedroom with adjacent bonus room, ideal for a second master suite. As well as a third bedroom and separate bath. There is also a separate room in the basement which can be used for added sleeping quarters. Short picturesque walk to an association sandy beach on Pleasant Bay. If you enjoy the open waters, there is an association dock on crows pond. Many upgrades have been added to the home. Air conditioning installed, Aprilaire humidifying system to improve air quality, new roof, new crawl space, new heating system, abundance of outdoor lighting added to surround the home and plantings, high end coastal drapery and blinds and new interior paint throughout. Home comes fully furnished with the exception of some wall pictures, entrance mirror and inside kitchen cabinet items: utensils, dishes, bowls, coffee percolator, pots etc. There is an electrical fence for dog owners. This is truly a must see property to appreciate all the home has to offer! Expansive views from outdoor decks capture one of Chatham's most stunning views of the Snake River, Hardings Beach and Nantucket Sound. Perched on a promontory is a uniquely designed 5 BR home on a private beautifully landscaped lot. The open main level offers a great room with wood burning fireplace, kitchen & dining room. Also featured are a large master suite, a spacious loft and several sleeping areas for family and friends. 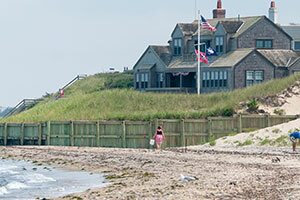 Kayak to Stage Harbor and Nantucket Sound from your waterfront property.